This week is the 200th Anniversary of the Battle of Waterloo, by far the biggest thing that ever happened round here so the various layers of Belgian local government and the former allies have finally got their act together to recognise that they have a “big thing” on their doorstep. 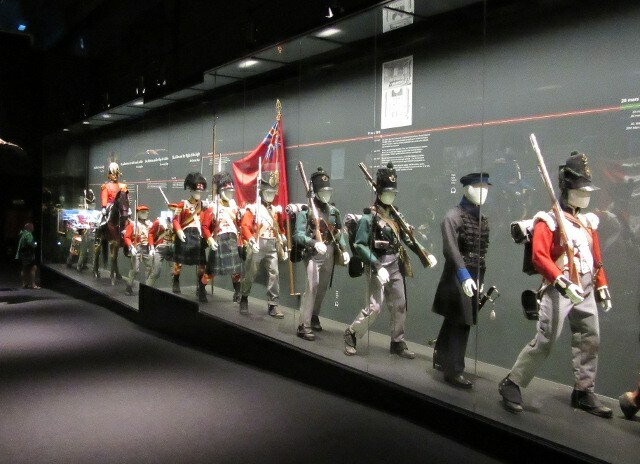 So this post is a sort of preview to our cycling excursions later this week when my father and I will be biking over to the big re-enactments and events that are scheduled for the anniversary weekend. 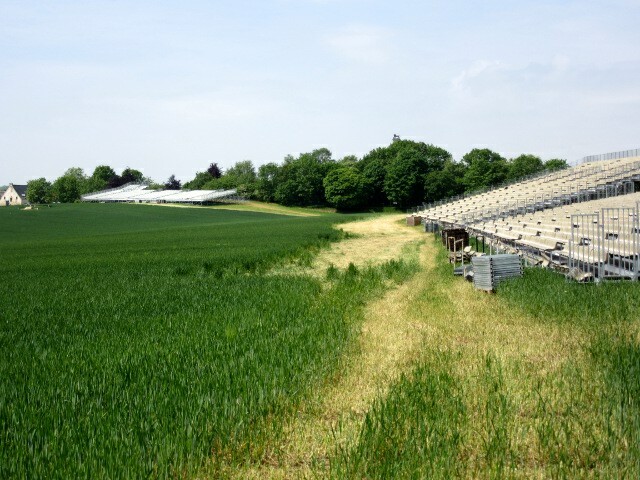 It is also a sign of hope, the area is getting a long overdue makeover that recognises the importance of the site. 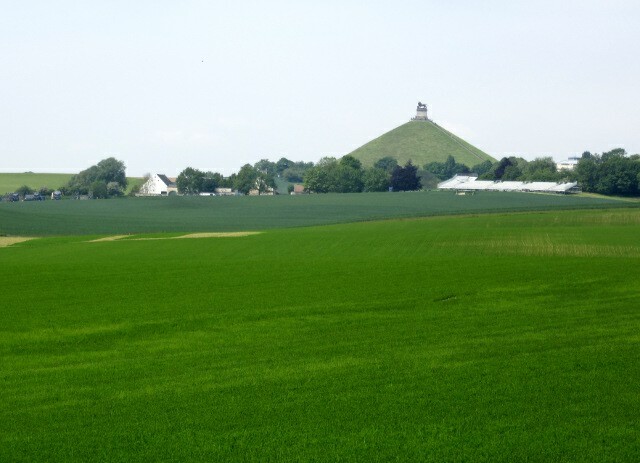 Since we moved to the area three years ago Waterloo battlefield has been an almost mandatory excursion for our visitors because it is a name that everybody knows and it is a very easy trip of just 8km by bike along some lovely quiet roads. 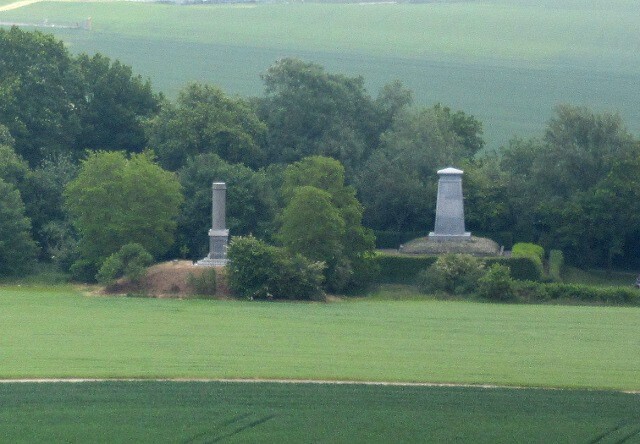 In fact it is so close we can see the huge “Lion’s Mound” which is the main monument to the battle by walking about 200 metres and looking through a gap in the trees. And the battle was spread over such a wide area that there are minor landmarks and monuments scattered all around the countryside between here and the battlefield so the story of the battle is sort of embedded in the landscape. I really have no interest at all in anything that risks glorifying war but I have really enjoyed reading up on the history of the battle because it is very easy to imagine it in an area that remains very rural and unspoilt. However there has always been a problem with the battlefield trips. I suspect that anyone with an interest in historic sites will heartily agree that until now the so called “Hamlet of the Lion” was one of the most unloved, scruffiest and unwelcoming international visitor centres that can be imagined. 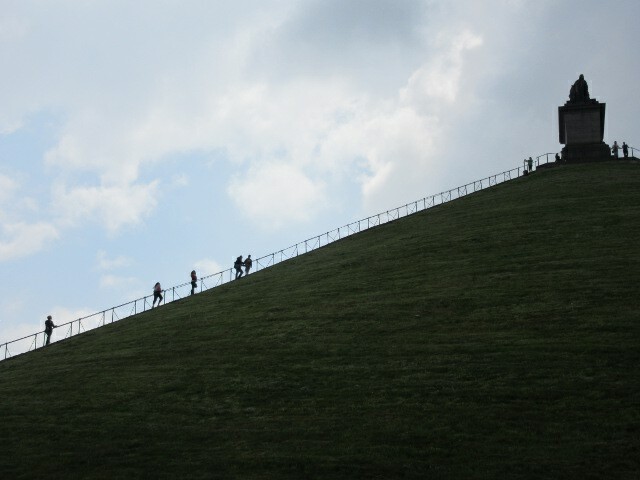 Fortunately the 256 steps up the giant mound to the Lion statue offer a great view over the landscape and a chance to imagine the topography of the battlefield. But the visitor centre was basically two short films, the 100 year old centenary “Panorama” was fading and water-stained while the waxworks really deserved its recent demolition. I have always reflected why that is. Historians generally agree that this was a milestone in European history and it certainly deserved respectful treatment, even if there is no local enthusiasm for commercialisation. One can blame lack of budgets, and personally I have a prejudice that Wallonia seems to have a cultural blockage when it comes to marketing and promotion. But greater understanding and reading have made me realise that perhaps the whole thing has been just a little bit “lost”. For starters the battle itself never took place in Waterloo. The town has had almost no influence at all in the development and marketing of the battlefield that made it famous, their main landmark is the Wellington Museum in the town. 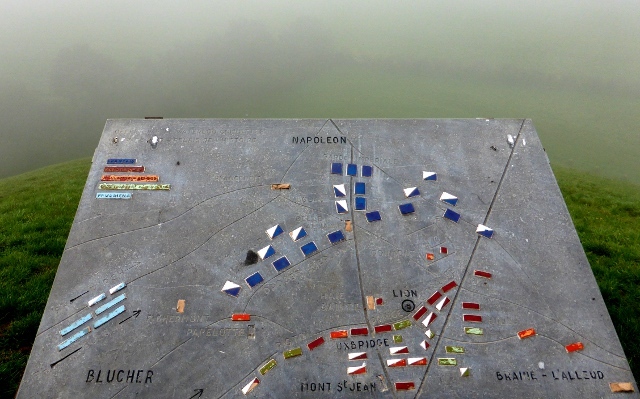 Wellington himself announced the name after the battle in a despatch to London, but in fact the fighting took place around Mont St. Jean in the modern Belgian communes of Braine l’Alleud and Lasne, Waterloo was some kilometres behind the lines. The other victor of the day, Prussian General Blücher wanted to call it the “Battle of the Belle Alliance”, the name of an inn where he and Wellington met at the end of the day’s fighting and in his eyes reflected the beautiful alliance of many countries that defeated Napoleon. The second reason that the battlefield might feel a bit unloved is because many of the countries that fought the battle don’t actually exist anymore. In 1815 Belgium didn’t exist at all, it was a group of former Austrian provinces in the southern part of the United Kingdom of the Netherlands and only broke away with a rebellion in 1830. So it wasn’t a Belgian victory, in fact it suggested Wellington didn’t trust his Belgian troops at all, worrying that the French speakers were potential deserters or spies. No reason there to celebrate! Also when I talk to Dutch people about the Battle of Waterloo it appears that it is not in their historical consciousness. And even less do they know that the first and largest monument – that great big lion – was the Dutch King’s monument, built on the spot where his son was hit by a musket ball and wounded. The other main army was Prussia; arriving in the late afternoon to change the course of the day. Other protagonists on the battlefield from modern Germany were representing duchies like Hanover, Brunswick and Nassau, fighting with the British. Each force has its own memorial in the area but they are not concentrated at the main visitor site and they are not national monuments for modern countries. 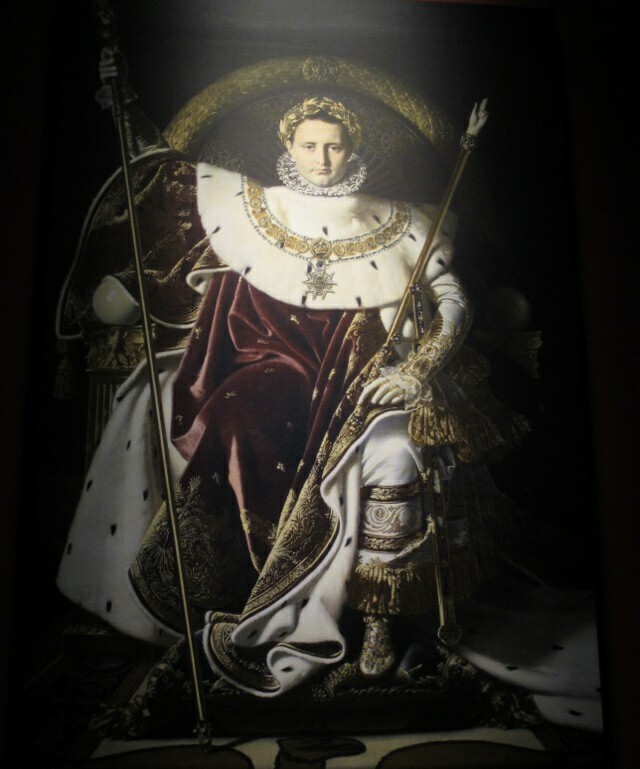 The two countries that do still exist and have a continuous line of history from that point take the battle much more seriously, the glories of Napoleon’s empire still resonate with some elements of French history and the British think of a great victory that opened up the route to a century of almost unlimited empire building, trade and power. But of course the site is not in their country. The third missing element from the battlefield is graves. 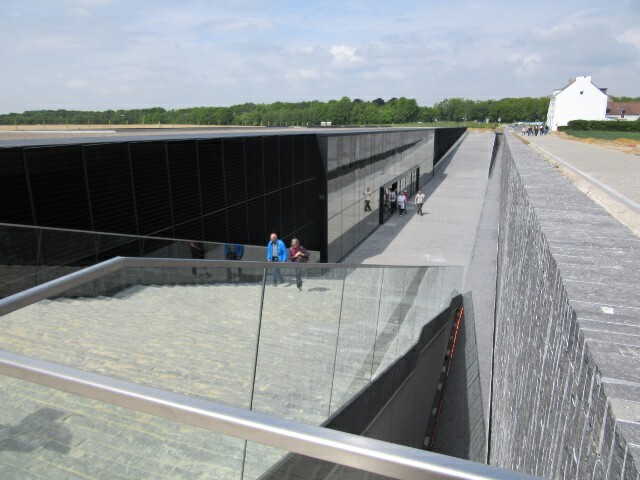 In that sense it really resembles many battlefields before the First World War, there are no fields of graves for descendants to visit for reflection. Around 50,000 men died in a single day and they are commemorated by low key memorials here and other symbols back in their home countries. Nothing like the impact that my visit to the commonwealth graves at Ypres had on me late last year. With these factors it is perhaps no surprise that the 100 year old postcards in the visitor centre showed a somewhat lonely and unloved tram stop near a field and a tavern that can be instantly recognised as the same location today. The wonderful views and pleasant bike ride always make it a good trip for my guests but perhaps this is just a location that nobody could love? However – “Stop the Press”. With the 200th Anniversary coming the various parties have finally got their act together and a big programme of restoration and commemoration has taken place which will reach its culmination next weekend. Demolitions and building started for real about a year ago when huge hole in the ground for a new visitor centre appeared, then in true local style nothing seemed to happen for months. 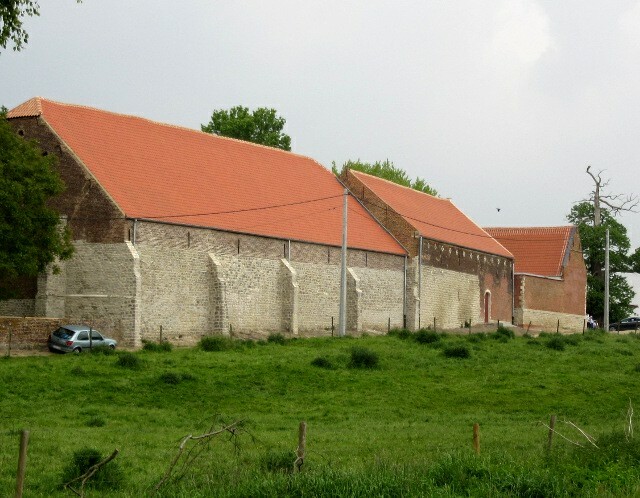 Cranes on the skyline suggested that the British Government’s donation for the restoration of the strategically important Hougoumont farm was being spent but there was no access or reporting to suggest any progress. Our village has adopted the Prussians as our part of the battle. We know that the Prussian army did an incredible cross country march from Wavre to join Wellington’s battlefield at Mont St Jean in the late afternoon. There are known landmarks on that route all around us, they paused to regroup around lunchtime just to our East and were then seen passing the village church as people came out of mass. It is easy to imagine the ghosts of the army walking down our lanes as we are almost on a direct line between those points. Just these past three weeks little signs appeared at the key points so we can trace the main route of the troops as they headed in to battle. As well as these small local steps I am much more enthusiastic about the Battle of Waterloo site since I went there recently. 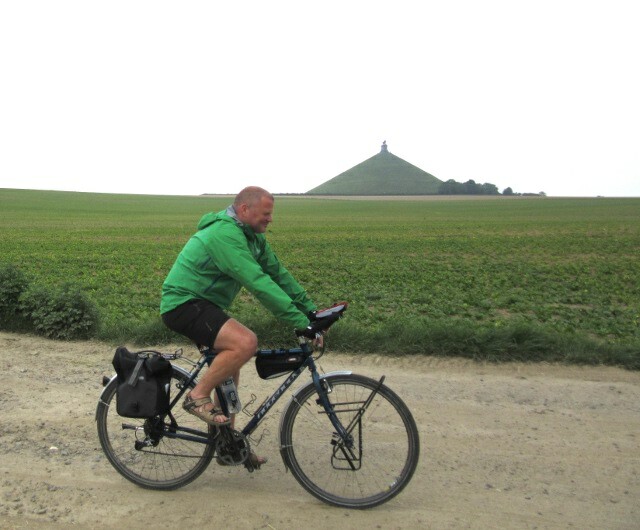 I was visited by cross Europe cyclist and author Andrew Sykes. As soon as he knew Waterloo was nearby he wanted to take a rest day from his international travels to take a look at the site and we took a ride out. I hadn’t been there since September of last year when our friends from Australia Susan and Neil were over visiting. It was a building site then and a grey, horrible mist decided to ruin the views, so all in all even less inspiring than usual. The first sign that Andrew and I were in for something different was that the grandstands for the re-enactments were already in place several weeks in advance, setting out the scale of the events to come. But the most striking change on site was the visitor centre. There was still work to do on the exterior but buried deep in the ground is a sleek marble and glass construction and when went in we found a modern, lively, well designed, interactive and thoroughly engaging experience that kept us entertained for more than an hour before we ventured out to the Lion Mound. What a transformation! 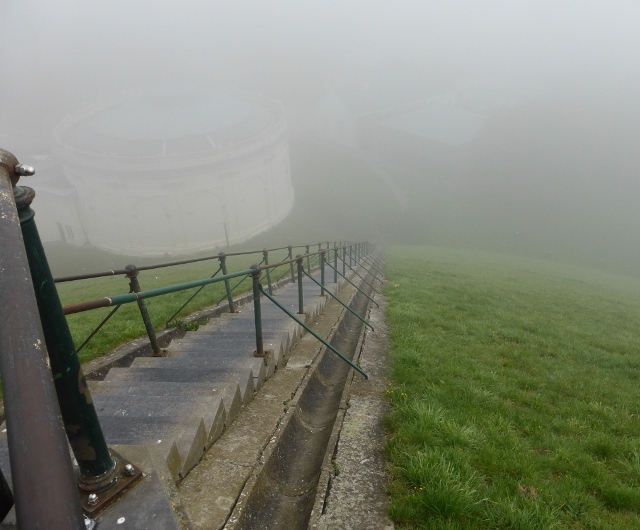 Around it the access to the Lion Mound has been improved a lot and it looks like the Panorama has had a facelift. This is the nearest our forebears got to 3D, they designed and built a circular building for a giant mural of the battlefield. Add some waxworks of soldiers, dead horses and trenches in front, flood it with natural light and a sound recording of battlefield noises and you have a battle going on around you. 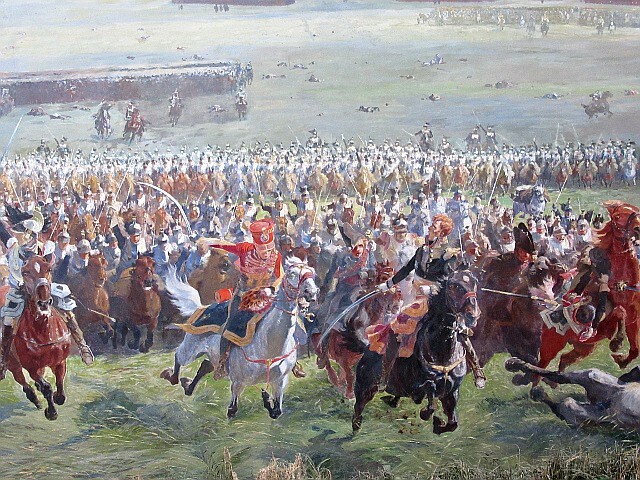 The French artist was clearly very keen on the glory of the French cavalry charges which are the most dramatic feature of the scene! 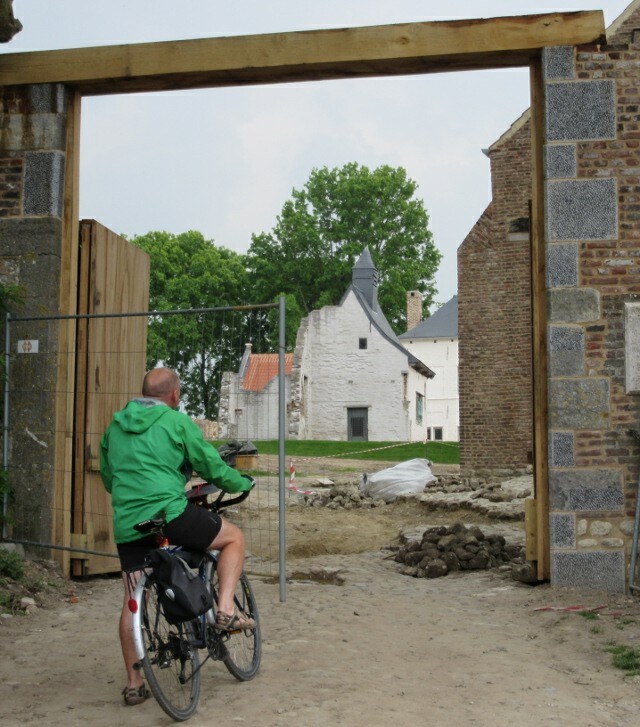 When we had looked around we cycled across the battlefield to the Hougoumont farm-chateau. This was the site of an all day battle within the battle. It is a typical local style of building, a large farm combining house and buildings in a square which made for a strong defensive position for the British in front of their own lines. It was only expected to resist the French for a few hours but it was defended all day and was critical to the final victory, draining French resources and causing problems on their flank. After the battle it became a working farm again but when the regional government took it over it was allowed to decay badly, another symbol of the unloved nature of the site. However an appeal for its restoration was successful, especially when the UK Government added €1.5million so it is being done up. It is not quite finished but we were able to cycle up to the gates and a have a peer over the walls where we could see that there has been a huge amount of work done. 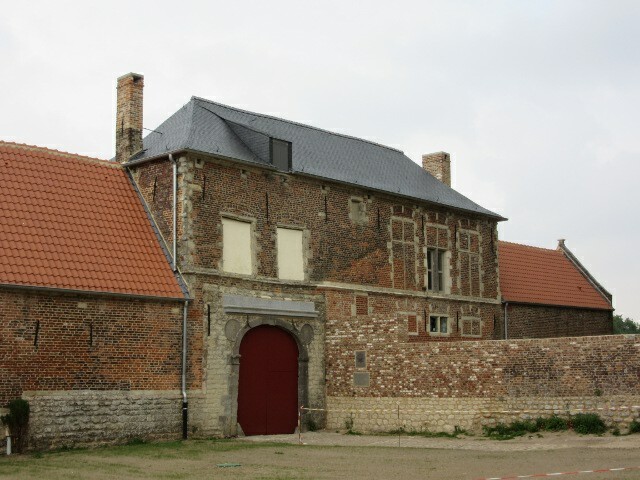 I have just read on the Hougoumont project web site that it too will be opening on 18th June, really at the very last possible minute for the anniversary. So that sets it up nicely for the events of this week, reportedly one of the biggest re-enactments of its kind ever with 5000 re-enacters, 300 horses and lots of cannons pulled in from all the re-enactment societies of Europe. 120,000 tickets have been sold for what should be quite a show and the events will be bringing the area to a standstill for 4 days. I am resisting the temptation to make lots of unkind comments about the show, I find the idea of grownups dressing up and firing popguns all just a little bit amusing, but I am going to try and respect the spectacle they are going to put on for us. 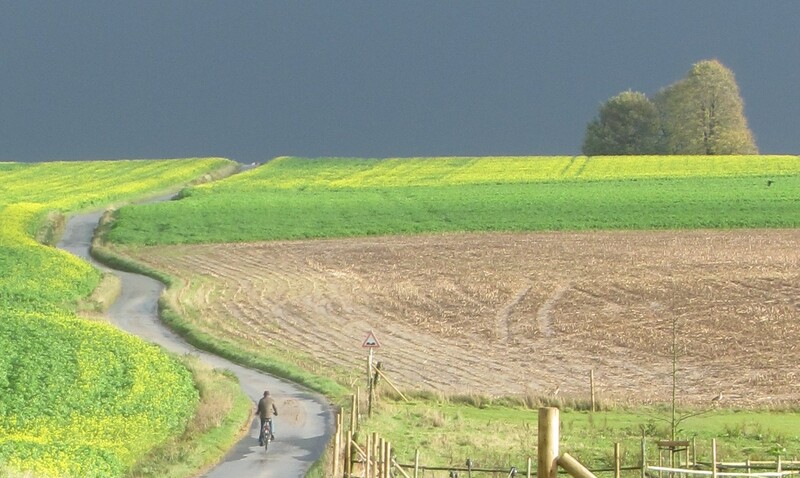 All I really want now is glorious mid-summer evenings as a backdrop so we can give you lots of colourful photographs to celebrate the re-birth of the battle of Waterloo site as a high quality international centre and somewhere we will be happy to keep taking our visitors for years to come. When I went there with Andrew he knew it was Eurovision Song Contest Day (I didn’t – honest) so of course there can only be one song to listen to while we wait. 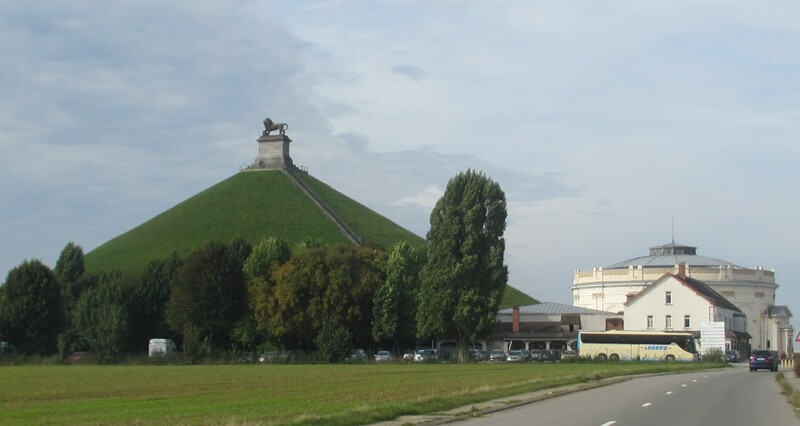 This entry was posted in Life in Belgium, Musings, Travel and tagged Abba, Anniversary, Battle of Waterloo, Belgique, Belgium, cycling, History, Military history, Tourism, visiting, Waterloo by kevinmayne. Bookmark the permalink. That story about the French veto of the commemorative 2 Euro coin says more about some French views of Waterloo than anything else the Belgians could have done. “The Imperial Guard – never defeated”. No other version of history can be considered! Nice description and update. 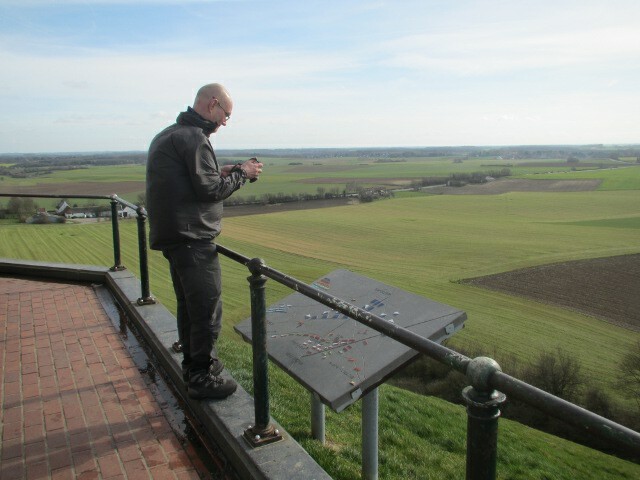 I will want to visit the battlefield the next time I am in Belgium. Thanks. I think now I can start to recommend it. A nice circular bike tour including the Solvay Park is my advice. The panorama looks amazing. I have visited a number of Civil War battlefields here in the US, and always find them to be sobering. The best ones don’t glorify war. Had to chuckle at the Abba video (watched it all the way to the end). So dated…..perfect. I keep kind of hoping Abba will turn up in the middle of the re-enactment. That would make it perfect. This sounds like a great chance to combine history and cycling. Always a fun mix. Exactly. 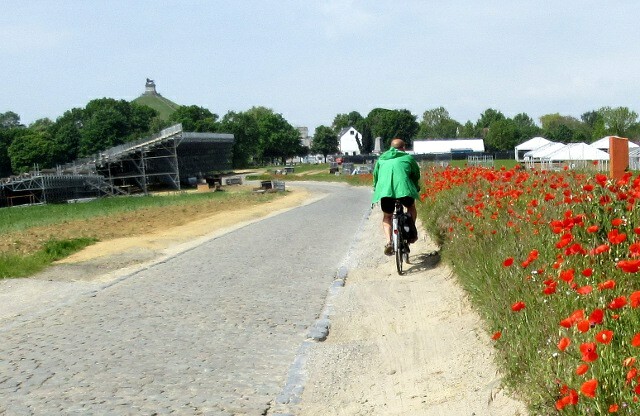 I feel like at some point someone local should publish a cycle tour of the whole battlefield, it would be the best way to take in the whole scale of it. Excellent post! I’ve been considering writing a piece about places cashing in on their connection to historical or literary events. Verona is my current leader, closely followed by Bremen. Just been in Bergerac too. Keep up the good work! In Belgium I would rate Ypres highly for having done its history well. I enjoyed some of Verona but I thought it’s complacency about the damage being done to its city centre by cars was a symptom that they get visitors flooding in just by their reputation. Padua and Bologna were nicer places to spend time.